August 26, 2015 marked the first anniversary of Israel’s offensive on the Gaza Strip, during which 2,219 Palestinians were killed. However, a large part of the story is left untold. Over half of those killed were refugees who were displaced from their homes in Yafa, Salama, Isdud, and many other villages and towns, as a result of and following the Nakba [‘catastrophe’] in 1948. The majority of those killed lived in refugee camps in the Gaza Strip within a 30 mile (50 km) radius of their homes of origin. A total of 1,236 refugees were killed during the 2014 offensive, including at least 309 children. 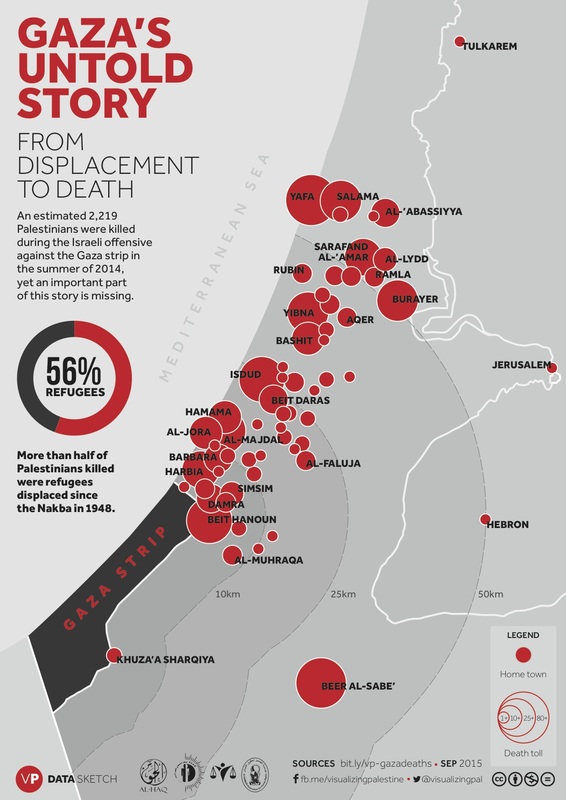 This infographic visually represents the untold story of Gaza’s refugees. Created by Visualizing Palestine in collaboration with four Palestinian human rights organizations, Al-Haq, the Al Mezan Centre for Human Rights, the Palestine Centre for Human Rights, and Al-Dameer Association for Human Rights, who launched a joint campaign to document Israel’s attacks during the 2014 offensive against the Gaza Strip. For Palestinian refugees, the Nakba did not end in 1948, as they have experienced a continued denial of justice. There are 1.3 million refugees residing in Gaza who are spread over eight refugee camps, making up almost three quarters of the total population of the Gaza Stip. Refugees residing in Gaza have faced multiple consequent internal displacements due to Israeli policies, including Israel’s three military offensives against Gaza over the last six years. Israel’s deadly military operations, as well as its eight-year closure of Gaza have had devastating effects on the entire population in Gaza. While all Palestinians in Gaza endure harsh living conditions, including irregular electricity and water supplies, these issues are even more acute in the refugee camps. [T]here is much at stake in all of this, in rendering the Nakba an event of the past, a fact on the ground that one cannot but accept, admit, and finally transcend; indeed that in order to move forward, one must leave the Nakba behind. Some have even suggested that if Israel acknowledges and apologizes for the Nakba, the Palestinians would forgive and forget, and the effects of the Nakba would be relegated to historical commemorations, not unlike the one we are having this year. In my view, the Nakba is none of these things, and the attempt to make this year  the 60th anniversary of the Nakba’s life and death is a grave error. The Nakba is in fact much older than 60 years and it is still with us, pulsating with life and coursing through history by piling up more calamities upon the Palestinian people… Much as the world would like to present Palestinians as living in a post-Nakba period, I insist that we live thoroughly in Nakba times. What we are doing this year is not an act of commemorating but an act of witnessing the ongoing Nakba that continues to destroy Palestine and the Palestinians. I submit, therefore, that this year is not the 60th anniversary of the Nakba at all, but rather one more year of enduring its brutality; that the history of the Nakba has never been a history of the past but decidedly a history of the present. This entry was posted in camp, Israel/Palestine, Middle East and tagged Gaza, Joseph Massad, Nakba, refugees by Derek Gregory. Bookmark the permalink.